Are There Foods That Strengthen Hair Folicles? 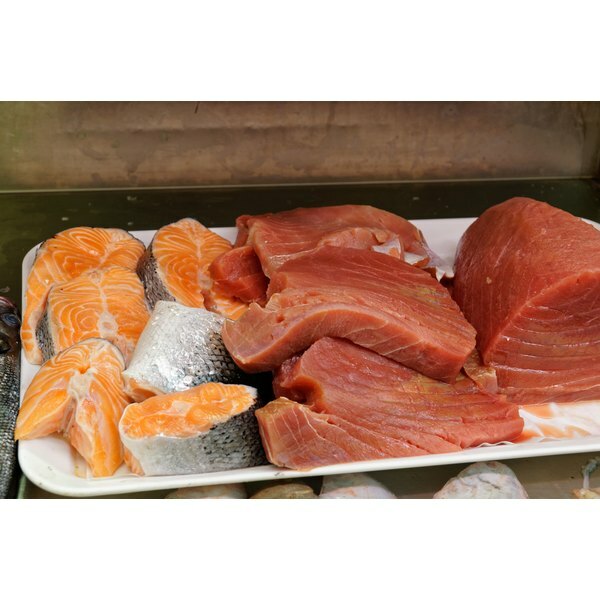 Amino acids and fish oils are both important nutrients that can enhance your health. They can be obtained in supplemental form or from foods as part of your regular diet. Omega-3 fatty acids -- the fats found in fish oil -- in particular are something that the American diet is often deficient in, so consuming more could be beneficial. Amino acids are essential for life itself. They make up protein molecules, which serve many different functions, including storage and transport, growth and repair, immune health and act as catalysts for reactions within the body. Amino acids come in two forms -- essential and non-essential. Your body can make the non-essential ones, but essential amino acids must come from your diet. Animal proteins such as meat, eggs and dairy contain all the essential amino acids, but most plant proteins are lacking at least one essential one. Therefore, to get all necessary amino acids from food, vegetarians need to combine protein sources, rather than just sticking to individual ones. Fish oil, or omega-3, also has key roles in the body. An adequate intake of fish oil can reduce the risk of certain cancers, heart disease and bolster your immune system, as well as potentially protecting against dementia, depression and arthritis. Their other roles include aiding healthy heart function, reducing inflammation within cells and helping fetal growth while lowering the incidence of allergies in infants when consumed during pregnancy. You'll find fish oil in oily fish such as herring, pilchards or salmon. As amino acids are components of protein, there is no set recommended intake for them, though there are requirements for protein intake. The Academy of Nutrition and dietetics suggests that sedentary men and women need 56 and 46 grams of protein per day respectively, while athletes need between 1.2 and 1.7 grams of protein per kilogram per day -- around 0.55 to 0.77 gram per pound. There's no specifically intake recommendation for the omega-3s found in fish oil. However, if you have no history of heart conditions or high triglyceride levels, the American Heart Association recommends two 3.5 ounce servings of oily fish per week. Supplements only really become useful if you have elevated amino acid or fish oil needs, or certain dietary restrictions. Amino acid supplementation may be useful for vegetarians or bodybuilders with a higher protein requirement, though even then, protein from whole foods would be preferable. Fish oil supplementation may be beneficial if you don't meet the American Heart Association's oily fish intake recommendation. Any supplements can have side effects, so it's crucial you check with your doctor before introducing any. Additionally, consuming your amino acids and fish oil from whole foods will always be preferable, as foods contain a host of other beneficial nutrients that supplements can't replicate. Academy of Nutrition and Dietetics: Protein and the Athlete – How Much Do You Need?